A riot in a town in Northwest China's Xinjiang Uyghur Autonomous Region killed 27 people, including 10 rioters on Wednesday, several days ahead of the anniversary of deadly riots in the region's capital in 2009. The violence took place in Lukqun township of Shanshan county, which is administered by Turpan in eastern Xinjiang. The town is about 280 kilometers away from the region's capital Urumqi. 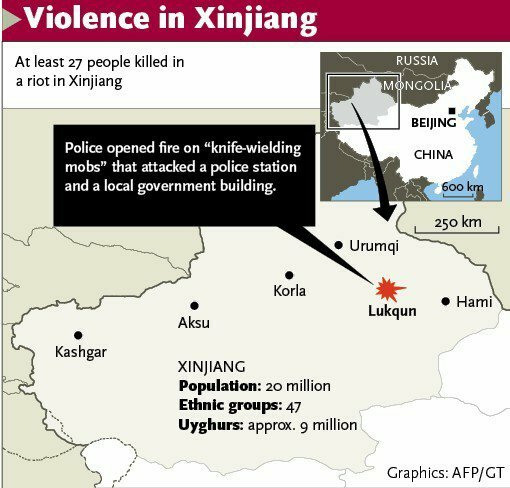 An official in Xinjiang, who asked to remain anonymous, told the Global Times that at around 6 am Wednesday, dozens of thugs armed with knives and incendiary devices attacked the township governmental building, a police station, a station of auxiliary police and a construction site. The attackers stabbed police officers and auxiliary police officers, government employees and civilians, set fire to the four buildings, and confronted police officers who rushed to the scene, said the official. According to him, after being caught off-guard, nine police officers and auxiliary police officers were killed, along with another eight government employees and civilians. Some injured were taken to a local hospital. The official said police shot dead 10 of the rioters and arrested three. They are still hunting down the rest of the attackers, but did not reveal how many are still at large. An anonymous businessman who works near Lukqun, Wednesday told the Global Times that since Wednesday morning large numbers of police officers have arrived in Shanshan county for reinforcement, and set up blocks on the roads to Lukqun to intercept the fugitives. The Hong Kong-based Takungpao reported on their website that the whole town was cordoned off with patrolling armed police. The Xinjiang official said the attack is still under investigation, but noted that earlier this year local police handled a case in which a store was attacked, which might have triggered the violence. He noted that the attack might have been prompted by the four-year anniversary of the deadly riots and the Islamic month of Ramadan drawing near. On July 5, 2009, a riot in Urumqi left 197 people dead and more than 1,600 injured. Local people in Xinjiang were shocked at the violence in Lukqun, though the region has witnessed a number of attacks in recent years, with the most recent one taking place on April 23 in Bachu county in southern Xinjiang leaving 21 dead, including six of the attackers. It is reported that nearly 90 percent of Lukqun's population are Uyghurs and the rest of them are Han or from other ethnic groups. A businessman surnamed Ma in Shanshan, which is 50 kilometers away from Lukqun, told the Global Times Wednesday that the small town used to enjoy peace and order, and there was no violence before. Li Wei, an expert on anti-terrorism with the Chinese Institutes of Contemporary International Relations, told the Global Times that with police reinforcing their strength in southern Xinjiang, terrorists sought to launch attacks in areas with relatively weak anti-terrorism measures. "They are also trying to arouse panic in other parts of the region," he said. Pan Zhiping, a research fellow with the Xinjiang Academy of Social Sciences, told the Global Times that the attack was a bid by terrorists to show that they are "willing to do anything anywhere" by starting chaos and panic in "peaceful" eastern Xinjiang, and exhibited the logic of "jihad." The attacks also raised concerns over the anti-terrorism capacities of police at the grass-roots level in Xinjiang. During the attack on April 23, only one of the police officers, who rushed to the scene after hearing the crime report, carried a firearm. Regarding this as a weak link in anti-terrorism efforts, Li noted that the build-up of rapid response forces and professional anti-terrorism forces at the grassroots level as well as better equipment are key ways to stamp out the threats.